Healthy skin naturally repairs itself. 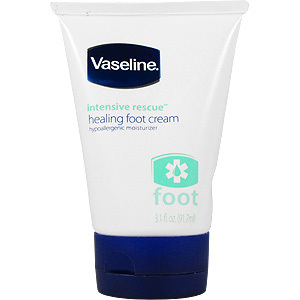 But the constant pounding feet take puts intense pressure on this natural process, leading to severely dry and rough skin. 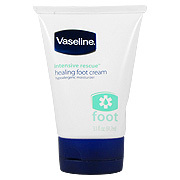 Vaseline Intensive Rescue Healing Foot Cream softens dry skin on contact. It the deeply moisturizes to promote the environment for skin's natural healing processes to occur, reducing roughness within five days. Warning: Keep out of reach of children. For external use only. Avoid contact with eyes. Sunburn Alert: This product contains an alpha hydroxy acid (AHA) that may increase your skin's sensitivity to the sun and particularly the possibility of sunburn. Use a sunscreen, wear protective clothing and limit sun exposure while using this product and for a week aftewards. Water, Petrolatum, Glycerin, Potassium Lactate, Stearic Acid, Glycol Stearate, Butylene Glycol, PEG-100 Stearate, Caprylic/Capric Triglyceride, Lactic Acid, Dimethicone, Helianthus Annuus (Sunflower) Seed Oil, Magnesium Aluminum Silicate, Cetyl Alcohol, Glyceryl Stearate, Ethylhexyl Methoxycinnamate, Ethylene Brassylate, Xanthan Gum, Hydroxyethylcellulose, DMDM Hydantoin, Disodium EDTA, Methylparaben. 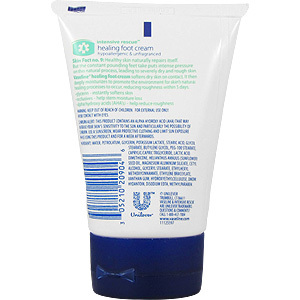 Intensive Rescue Healing Foot Cream is shipped in a discrete, unmarked package. Orders are processed immediately and usually take about 3 to 5 working days to be received. We do ask that you try it for 2 to 3 weeks to feel the full effects. Any information received is used only for order processing and shipping purposes. Your information, such as e-mail address, will never be disclosed to a third party.